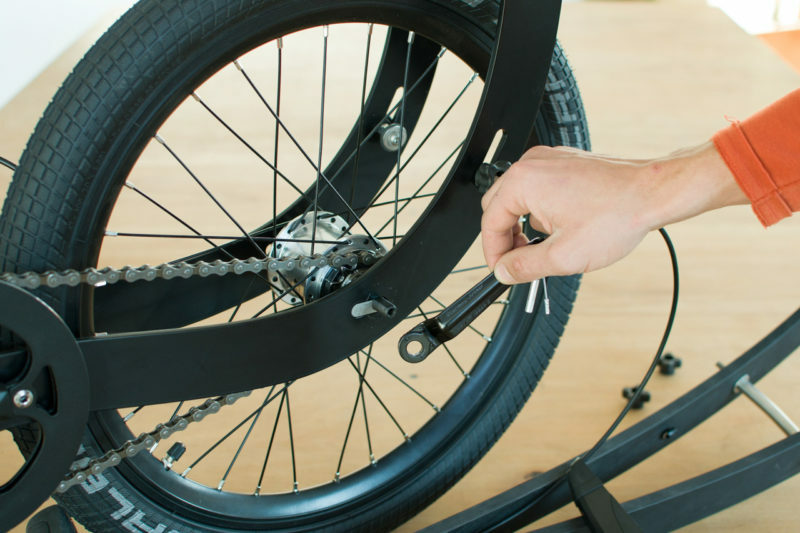 Front Tire Replacement | Halfbike | The compact and light standing bike, anywhere with you! For a start fold down your Halfbike. 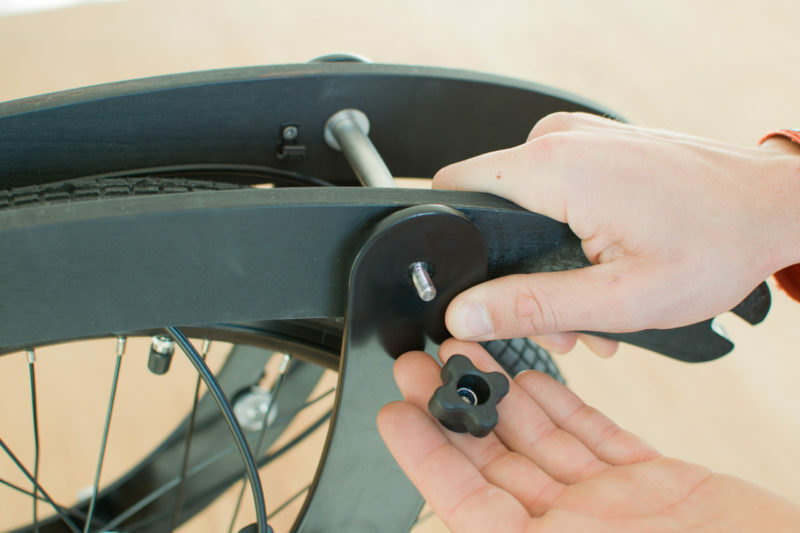 Then remove the brake cable and gear cable from the clips on the handlebar.Undo the screws that hold the handle in place so that you can detach it from the frame. 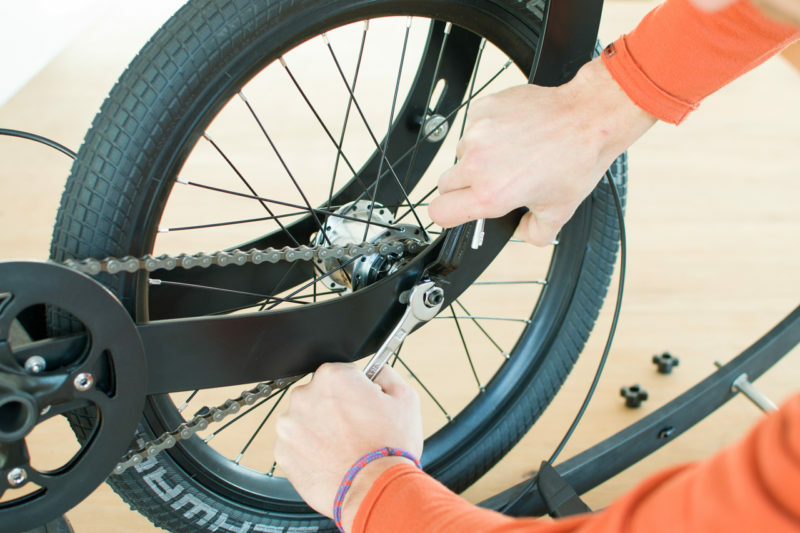 Loosen the safety nut on the gear cable and then unscrew the the tensioner. Use a wrench (15mm) to unscrew the nut that holds the tire. 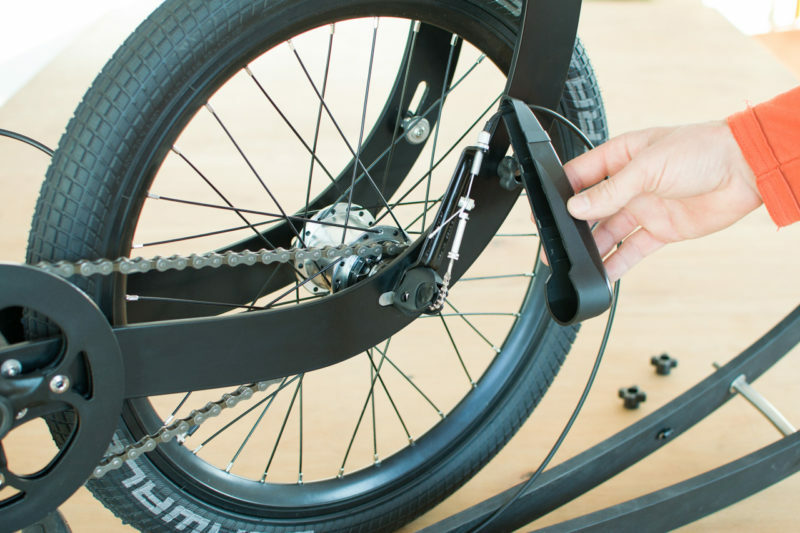 Remove the metal console that holds that attaches to the brake cable. Undo the domed nut from the axle at the other side. (Again using 15mm wrench.) Remove the nut and washer. Pay attention the position of the washer before you take it out. There’s a small metal insert (tug) that holds the axle in place and prevents it to slide backwards. Pay attention to its position and take it out. Note that this is a very important part so make sure that you install it the same way afterwards. 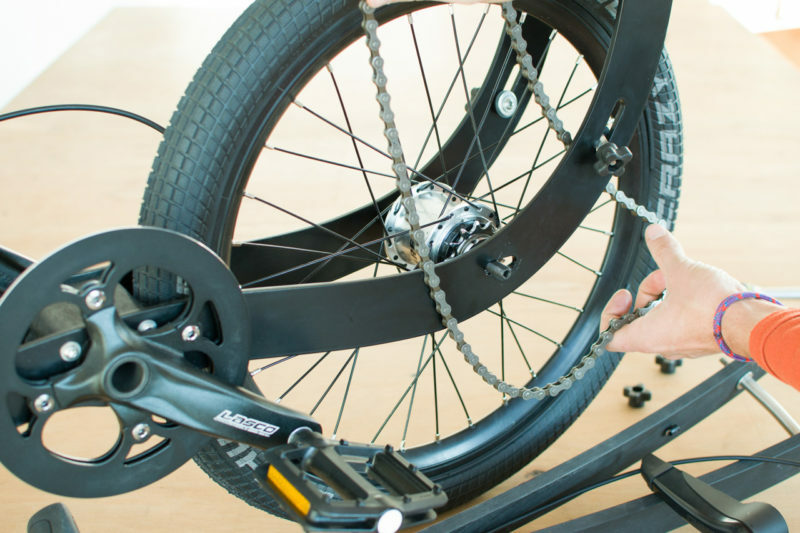 Now you’d be able to slide the wheel backwards and remove the chain. Using both your hands gently widen the frame as shown on the picture. Be gentle as there’s a chance to bend the frame if you use too much force. The key is to widen it just enough to remove the axle from the frame. And don’t forget to mind the paint. 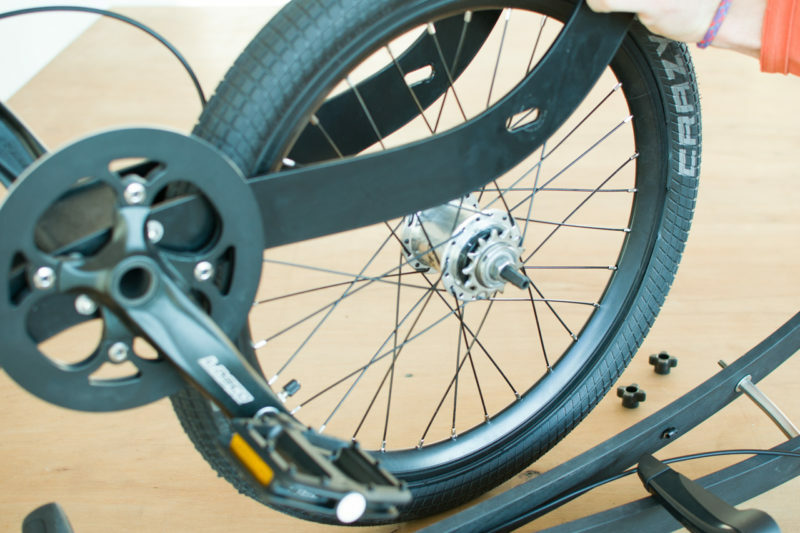 Once you take the wheel out of the frame you can proceed and repair the flat tire like on a regular bicycle. Once you’re ready it’s time for the interesting part. Assembly of your Halfbike. Basically you’ll need to redo the steps so far. However there are a few steps that require extra caution and you’d like to get those right. 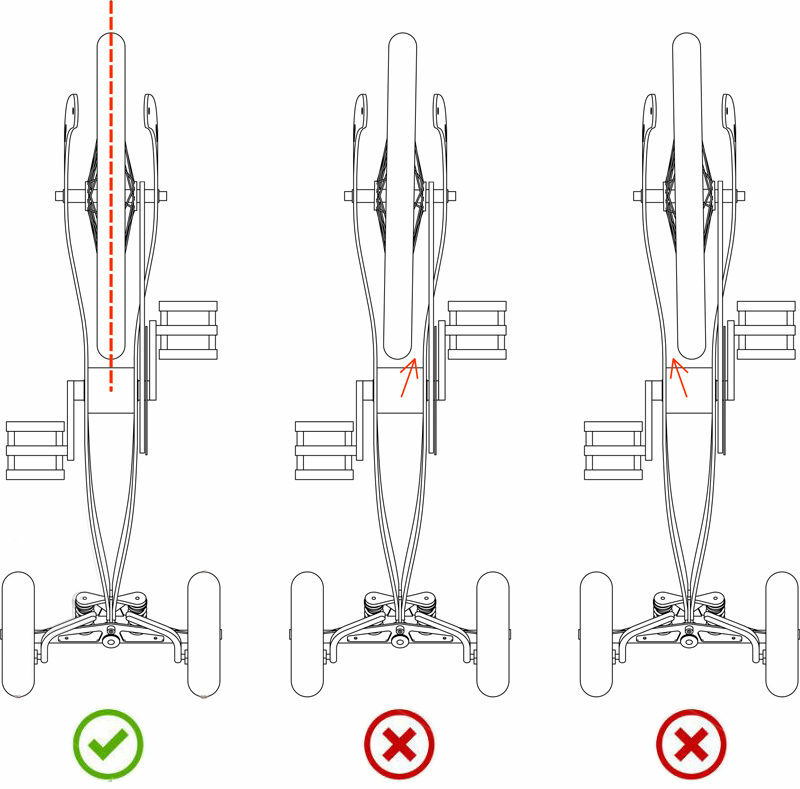 Once again we suggest that you pay attention to the original position of all components when you disassemble the Halfbike. You’d like to return them to exactly the same configuration to ensure that your Halfbike is properly assembled and tuned. Using both your hands gently widen the frame as shown on the picture. Be gentle as there’s a chance to bend the frame if you use too much force. The key is to widen it just enough to insert the axle into the frame. Again mind the paint. Slide the wheel back and put the the chain. It’s easier if you put it on the small sprocket first and then the crankset. Insert the tug (small metal piece) that holds the axle in place and prevents it to slide backwards. 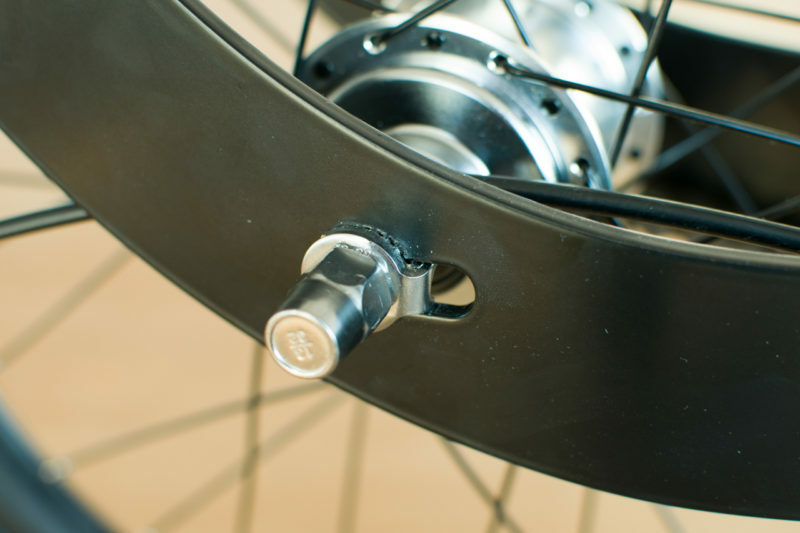 Than fit the metal console that attaches to the brake cable, screw on the nut on the axle by hand. Do not tighten it yet, just screw it by hand to hold the components in place and still allow them to move freely. On the other side put the washer and domed nut and screw the nut by hand. Again no need to tighten it yet. It’s key to have both sides loose at this point to allow for aligning the wheel. 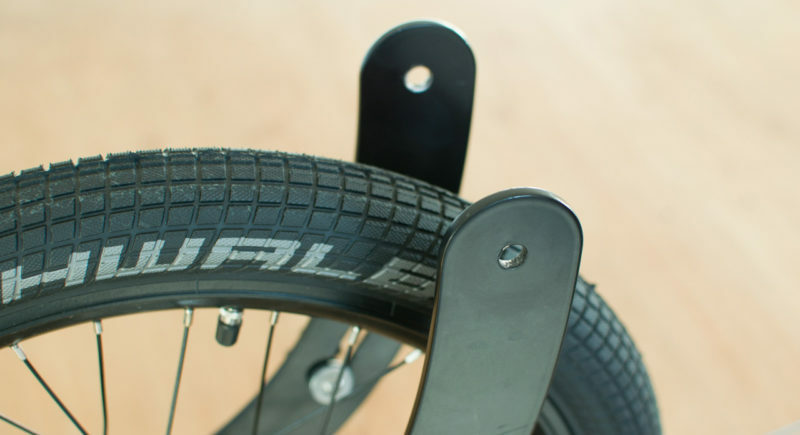 Make sure that the tire stays centered into the frame as shown in the picture. 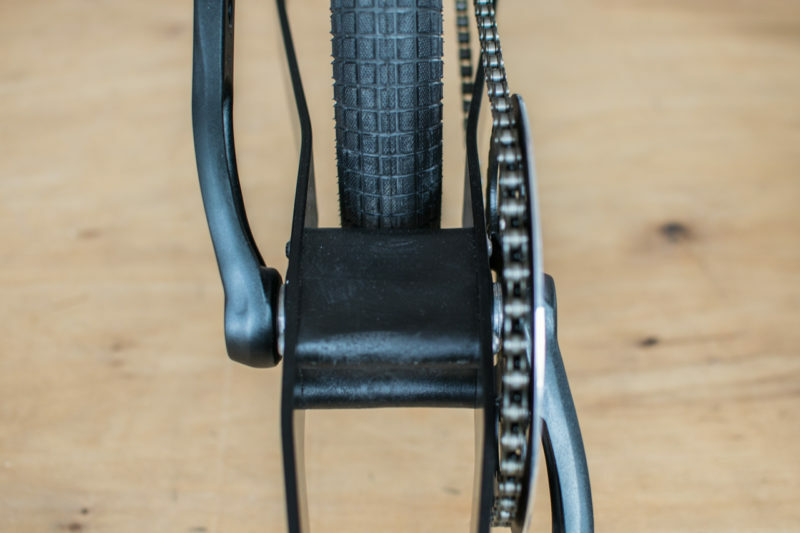 The distance between the tire and each side of the frame should be equal. 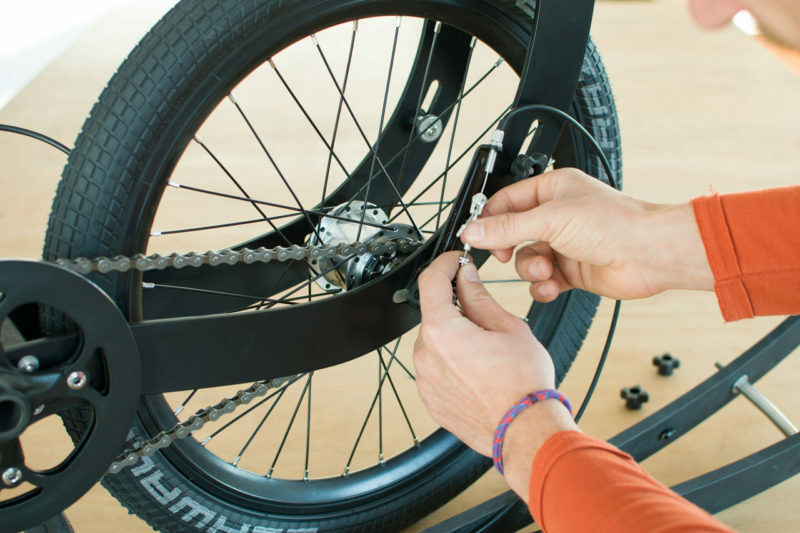 Once the wheel is in position hold it there with one hand and with your other hand tighten the domed nut with a 15mm wrench. After the domed nut is properly tightened check if the wheel is still aligned. This is an important check as it will ensure that your Halfbike is well adjusted. If the wheel has shifted off-center loosen the nut and repeat this step. 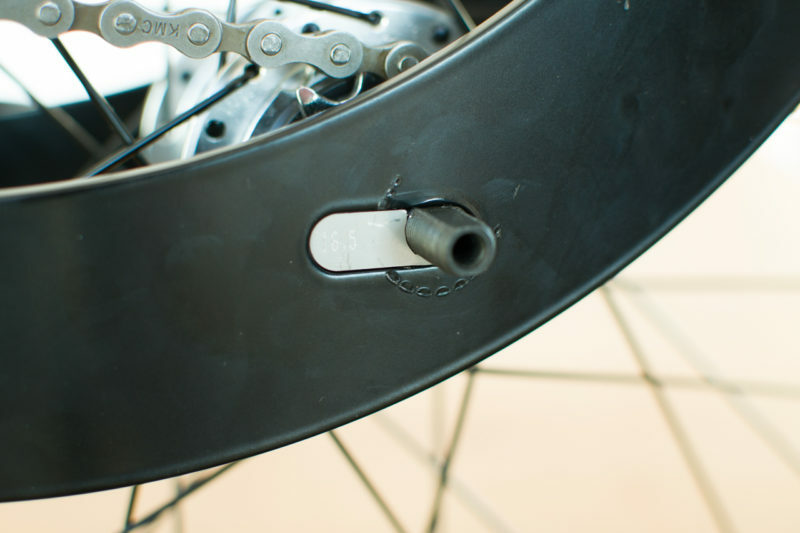 Point the metal console that holds that attaches to the brake cable up towards the handlebar (the same direction as it was) and then tighten the nut with a wrench. Once the nut is tightened check again if the wheel is still aligned. 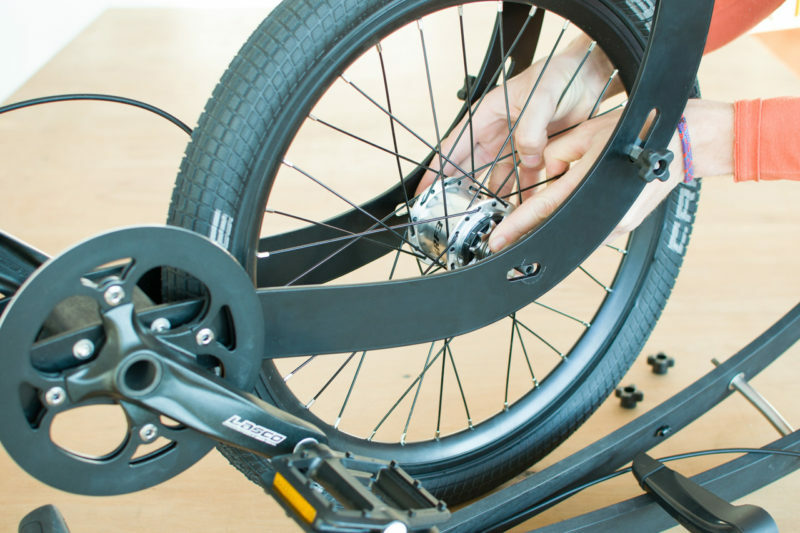 This is an important check as it will ensure that your Halfbike is well adjusted. 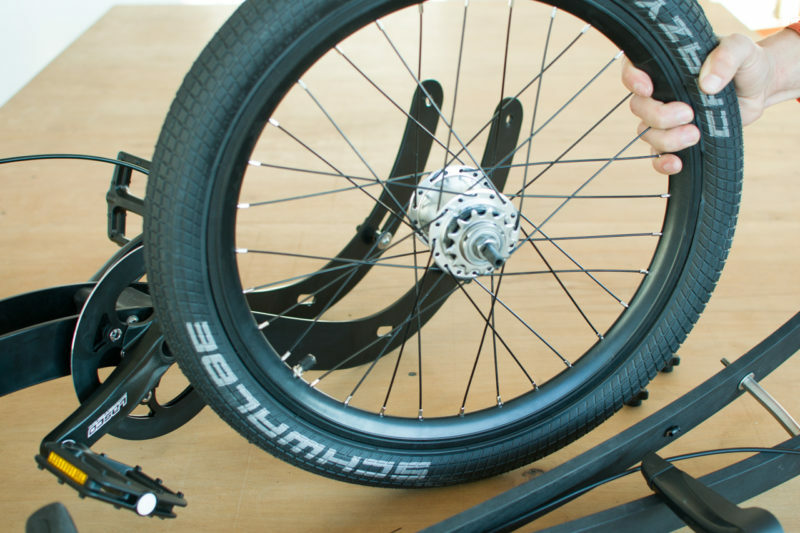 If the wheel is OK try to tighten the nuts at both sides again. It’s key that both nuts are securely tighten. Then proceed to the next step. If the wheel has shifted off-center loosen the nut and repeat this step. Press in the plastic part with the pulley. It may require applying some force and wobbling the part at the same time. Make sure that it goes all the way back. Screw the the tensioner to the chain-piece that stick out of the axle. Adjust the gears and then secure the safety nut. You can find a dedicated tutorial on adjusting gear adjustment here. It shows in more detail how this step should be performed.